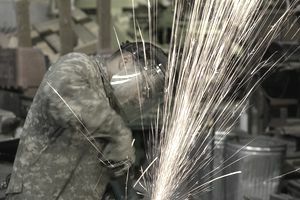 The Army used to treat welding and machining as separate jobs, but now categorize the two in military occupational specialty (MOS) 91E, Allied Trade Specialist. Those who come to the Army with some experience in one of these trades will be fully trained in the other by the time they complete their training. Army allied trade specialists fabricate, repair, and modify metallic and nonmetallic parts, operating lathes, drill presses, grinders, power saws, hydraulic presses, drills and various other tools and machine shop equipment. These soldiers are among the Army's most important builders, supplying metal and metalwork for Army equipment, vehicles, and structures. Allied trade specialists take the requisite ten weeks of Basic Combat Training (also known as boot camp), and 19 weeks of Advanced Individual Training (AIT) at Fort Lee in Virginia. Soldiers in this MOS learn machining, lathe operations, milling operations, and welding. The welding portion of the course includes learning how to operate gas tungsten and gas metal arc welding equipment, as well as shielded metal arc welding techniques. You'll learn safety procedures, how to use different metals and how to set up and operate various machines. You'll need a score of 98 in the general mechanical aptitude area of the Armed Services Vocational Aptitude Battery (ASVAB) tests, or a combination of an 88 in GM and a 92 in the general technical (GT) segment. There's no Department of Defense security clearance requirement for this job, but normal color vision is required, and you'll need to be able to pass the Army's depth perception tests. You'll also need to have near and distance visual acuity of at least 20/30 in each eye with or without corrective lenses. If you have welding experience, you may be able to move through the training process of MOS 91E more quickly, likewise if you have experience as a machinist. And any experience in a tool or machine shop will put you at an advantage in this MOS. The skills you learn will help prepare you for a career with factories and repair shops in many industries, including the electrical product, automotive, and heavy machinery industries. Since you'll be fully trained as both a welder and a machinist by the time you complete your training, you'll be well-positioned for many high-paying civilian jobs. Construction work should always be available to you with your Army training, and you'll likely be able to serve as a supervisor of other welders and machinists.